Kathy Griffin playing the martyr is about as accepting as Mel Gibson playing the martyr after his anti-Semitic rants. Face it! Kathy Griffin has made her career as huge as it is today but pulling people down in the most verbally abusive way possible. Yes, she is a comedian so she gets a lot of lenience in my opinion but even with that she goes to far, because some of the junk, well, it isn't funny. It's shock jock tactics. And most people laugh or gasp because they can't believe the little lady on stage saying that. Sorta like if Betty White says a dirty word it's funny because your shocked, if anyone else had said it you wouldn't have cared. 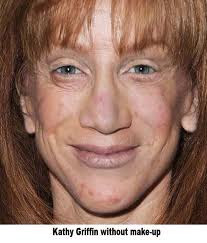 Griffin is often compared to Joan Rivers, sometimes even consider "today's Joan Rivers" but I don't see why. Joan is a comedic genius. She can banter off the cuff, she writes her entire material and no matter how far she goes it's meant to be funny, not to bully or shock. You laugh because the lady has a brilliant mind and can put some absurd and crude material at times together, but when she does it isn't for the sake of just saying the words, they have a punch line. Funny is funny even if it is X Rated funny, R Rated funny, or Disney funny. To me, what Kathy does in her stand up act is complete assignations and shock. She has some hilarious moments but so do most comedians. I was a fan of Kathy for years, ever since the Suddenly Susan days. But to take her seriously as a martyr on the Rosie Show is the ultimate joke. Because the joke's on you if you receive it. I've met Kathy 3 times. She was wonderful to me, I have no axe to grind, I just am so tired of her joining the "Stop bullying campaigns" for face time on TV when she is a bully herself. And puhleeze, if she is band at the View, then why the heck is she on there even after her public claims of being banned. Watch the link below if you want to check out her poor pitiful me stories. You say Kathy is "pulling people down in the most verbally abusive way possible". If you believe this, why would you call a person "Physco" or a "Nutcase" just because they didn't have butter, You did that and Isn't that verbal abuse? If you don't like Kathy, why post her picture? Chris: I'm not playing the martyr. If I post a youtube video and complain about not having a butter, you are more than welcome to call me Physco and Nutcase. You can anyway.. I don't mind. Thanks for visiting. I never said you were a psycho or a nutcase. You're the person that expressed those ugly words about an innocent boy that wasn't bothering you, so why pick on him???? Isn't that bullying? It breaks my heart to see an innocent person being picked on. Well Chris, I'm so sorry that your feelings were so deeply hurt by the fact that I among many other people nationally spoke about the butter video. Again, in my post on Kathy, I was referring to the fact that she complains of being bullied when she is a bully herself. I have not complained of such an issue. You are more than willing to bully me. And as far as the butter boy goes, nothing against him, but the video seemed hyper extreme. Again, thanks for visiting the page and hope you will again.